Striving to be better at what you do is important for your development. Though, it typically translates into developing what you know rather than how you act. For consulting (or any job), there are two parts to the equation; Hard Skills & Soft skills. Balance is needed so you should learn to develop both. I aim to help people develop their soft skills. They are typically harder to define and require more attention. Below are concepts I work on developing every day and hopefully you can take some away and start developing them for yourself. The link between quality & trust is easy to understand. When a relationship or engagement is new, you must prove yourself. The best way is to deliver something of superior quality. Whether that’s a presentation, application or a document. Do what you can to make it a quality output. It can be difficult to define what the quality standard should be so it’s important to set this upfront. Delivering quality is the best way to build trust however, being aware of when trust it exists is challenging. Know where you are at on the spectrum. It’s not as easy as asking ‘do you trust me’. Start with small tests to gauge where you are, build up to something bigger. Once trust is established, only then can you start being opportunistic and by that, I mean, challenge peoples thinking, pitching ideas, pitching for more work. If it doesn’t exist, work on getting it. This is how people see you. Your actions, traits & values have a direct correlation to your brand. What you are known for? How effective do people think you are? How well do you know your domain of expertise? At some point, people will talk about you. Managers, customers or colleagues both past & future. These conversations, ones you aren’t involved in, define your brand and it’s important you own it. Sounds simple enough. What you agree to in meetings, quick conversations or any other discussion. Manage them, follow up on them & keep on top of them. Let people know where they are up to. Don’t ignore them. Often, we forget the small things we commit to. I’ve found it’s delivering on these small things that go a long way in building quality relationships. People tend not to forget if you let them down. Diligence is important to your brand. Avoid being that person who can’t keep commitments. Before getting to this one, I’ll say that work can be tough. Mental health is far more important than any job you will ever work. Know your limits. If you are in need support, please seek it. Most companies have an assistance programs available so contact your manager or HR representative if you are feeling overwhelmed. Something always goes wrong. You project isn’t delivering quality, a relationship is damaged, you can’t get something signed off or you’ve just gone live and everything is on fire. For me, building resilience has been key to being successful in consulting. When things aren’t going well it’s difficult to get motivated, relationships are left in the balance, and you probably want to give up. I believe it’s in these tough moments, our true character really comes out. Do you pull out all stops to get things back on track? Do you give up? How do you respond to these situations? Passion is a beautiful thing. When harnessed and used in the right way it can lead to amazing things. We get passionate about what we create or are heavily involved in, so when things don’t go your way it’s very easy to get frustrated & annoyed. In these situations, it’s important to not let your emotions guide your reaction. They always manifest in negative ways. You become short, you get agitated, frustrated quicker and if left unchecked can impact the work you deliver. Don’t write that email. Avoid confronting that person. Go and take time to think about a response. Play the ball. Not the person. What do you stand for? What’s the right thing to do? Morally & ethically, these are difficult questions to answer. People that know & live through their values are more content with their work & personal lives. Understanding these goes way beyond anything you can do at work. I’m of the view that your values are generally set by age 6 and from that point develop & mature. Work to identify what your values & seek work that aligns with them. When personal values don’t align with professional, it leads to a world of pain. Hopefully this list can help you sharpen your softer skills & make you a more effective consultant. It’s one thing to convert a conversation around a broad scope of work into a well-defined and articulated, 3 to 4-page proposal (sometimes 20 +, depending on whose template you’re using), it’s another thing for a client or customer to read through this document, often, multiple times due to a review and response cycle, before finally agreeing to it. Most don’t enjoy this process. Client stakeholders usually look for a few key things when it comes to the SOW: price, time (hours) and key dates. Other parts are usually skimmed over or can be missed altogether, at least in my experience. While the above might be nothing new, perhaps it’s time to ask ourselves whether there’s a better way of doing this – can the client business owner, or nominated stakeholder on behalf of the business owner, be more involved, collaboratively in the SOW writing process so that unified goal between supplier and customer be achieved? Recent engagements with various stakeholders have made me realise, as a business analyst, how crucial this aspect of the project is and can, at times, be a sore point to reference back to when the project is in-flight, and expectations don’t align with what is in writing. Therefore, entering an engagement with the mindset of getting semantics right from the get go might save from hindering any quality to delivering down the line. Usually engaging in potential work with a client involves a conversation – not a sales pitch, just simply talking it through. What follows from here for effective SOW writing is what underpins any good collaborative effort – a channel of clear and responsive communication. Define what it will cost based on all the known variables – avoid basing this on ambiguity or pre-gap analysis of the outlined work at this stage. By defining the ‘pre-sales’ in this way, and by communicating effectively with your client during a proposal, the ‘joyless’ experience of writing a SOW (as it can be commonly perceived) may be alleviated and player a smaller role in convincing your client to work with you. It’s refreshing to view this process unlike a proposal, but rather a conversation. After the discovery call, we should establish confidence in the client with us as consultants. The only thing left to deal with now is the project itself. Taking my inspiration from Comedy Central, the Yammer Roast is a forum in which we can directly address resistances around Yammer, its role, and past failures in retrospect. Some of my clients have tried with Yammer and concluded that for various reasons it’s failed to take hold. For some the value is clear and it’s a case of putting a compelling approach and supporting rationale to sponsors and consumers who remain sceptical. For others, they are looking for a way to make it work in their current collaboration landscape. The Yammer roast is designed to tease out, recognise and address key resistances. It’s not an opportunity to blindly evangelise Yammer; it’s an exercise in consulting to provide some clarification around Yammer as a business solution, and what’s needed for a successful implementation. 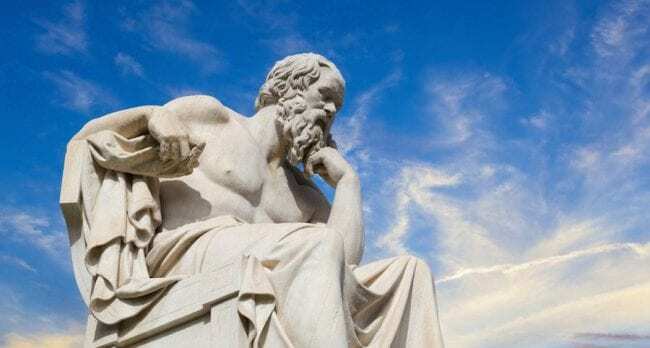 In this article, I’ll cover some of the popular resistances aired at Yammer Roasts, why these resistances exist and how you can address them. If you’re an advocate for social networking in your own organisation, my hope is that this can inform your own discussion. There’s a perception that Yammer is a form of distraction and employees will be off posting nonsense on Yammer instead of doing proper work. Even worse, they may be conducting themselves inappropriately. A self-sustaining Yammer network has to find that balance between [non-work stuff] and [work stuff], and it needs an element of both to be successful. Informal, social contributions beget more meaningful work contributions. Consider what is perceived as informal, non-work-stuff to be valuable. That person who just posted a cat picture? They are adopting your platform. As are those people who liked or commented on it. Consider the value to the organisation if people are connecting with each other and forming new relationships, outside of the confines of an organisational hierarchy. Establish a core principal that no contribution should be discouraged. It really doesn’t matter where content in Yammer is generated, and any one person’s view of the content is informed by who they follow, the groups they subscribe to and the popularity of content. 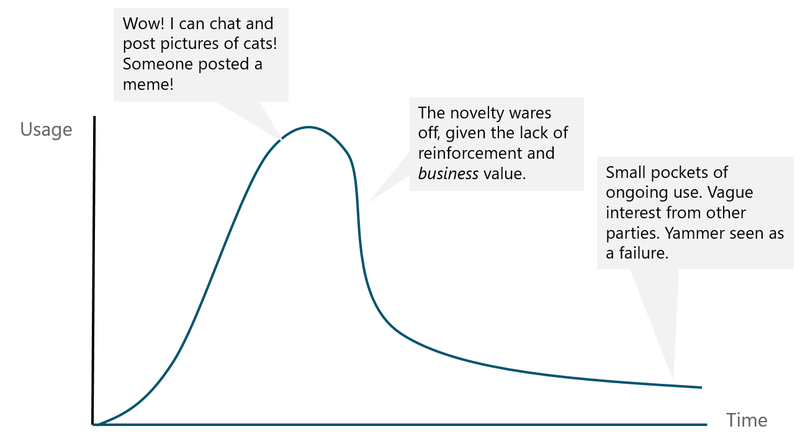 Uninteresting, irrelevant content is quickly hidden over time. “But what if someone puts a cat picture in the All Company feed?” So what? What if the CEO likes it? Consider creating a foundational set of groups to ensure that on day one there’s more than just the All Company feed. Strike that balance between work-stuff and non-work stuff. Set an objective for your community manager (yes, a formal responsibility!) to help combat potential stage fright; there are numerous incentives and initiatives that can come into play here. Accept the fact that your social network will, and should, grow organically. We’ve got Yammer and no-one is using it. …but your partners and vendors are and they’re looking to collaborate with you. Stagnant networks; a common scenario. Your organisation may be looking at alternative platforms as a way to reset/relaunch. Here, you lament the lack of tangible, measurable business outcomes at the outset of the initial rollout or the lack of investment in change management activities to help drive adoption of the platform. But, for whatever reason, you’re here. So how can past experiences inform future activities? Whether you use Yammer or not, the success of your social network in its infancy is dependent on measurable business outcomes. Without the right supporting campaign, a way to track adoption and a way to draw insight from usage, you effectively roll the dice with simply ‘turning it on’. 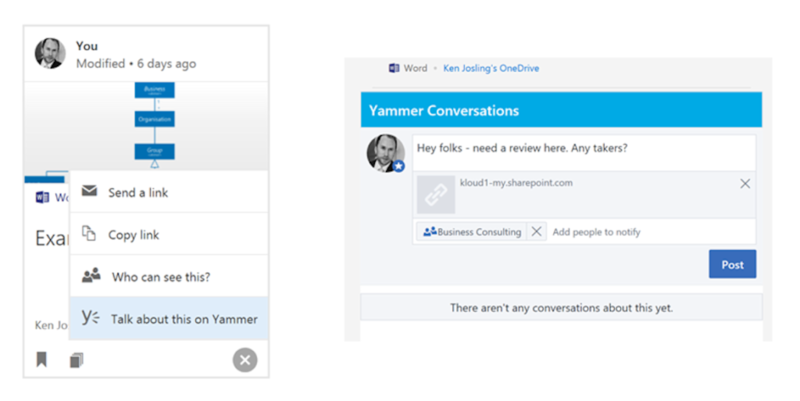 Initiatives around Yammer can start small with a goal of communicating the success (of a process) and subsequently widening its application within your business. Simply swapping out the technology without thinking about the business outcome may renew interest from sponsors who’ve lost faith in the current product, but you risk a rinse and repeat scenario. “But we’re dependent on executive sponsorship!” I hear you lament. This is a by-product of early boilerplate change campaigns, where success somehow rested on executives jumping in to lead by example. Don’t get me wrong, it’s great when this happens. From my perspective, you need any group within your business with a value use case and the willingness to try. You have O365, the technology is there. You can consider the Yammer client to not just be a portal into your network, but the networks of your vendors and partners. Access to your partner/vendor product teams (via Yammer External Networks) and being able to leverage subject matter expertise from them and the wider community is a compelling case in the absence of an internal use case. Feature parity – it can be a head scratcher. “But we can collaborate in Skype. And Teams! And Yammer! And via text! What will our users do?” Enterprise architects will be advocating the current strategic platform in the absence of a differentiator, or exception. Your managed services team will be flagging additional training needs. There will be additional overheads. If you’re there to champion Yammer in the face of an incumbent (or competing) solution, you need to adopt the tried and tested approach which is 1. Identify the differentiator and align the new technology (i.e. Yammer) to it, 2. Quantify the investment, and 3. Outline the return on investment. As a consultant my first conversations are always focused around the role Yammer will play in your organisation’s collaboration landscape. The objective is to ensure initial messaging about Yammer will provide the required clarity and context. This reminds me of an engagement some time ago; an organisation with a frontline workforce off the radar forming working groups in Facebook. “We aren’t across what’s going on. We need to bring them over to Yammer.” Objective noted, but consider the fact that a) these users have established their networks and their personal brand, b) they are collaborating in the knowledge that big brother isn’t watching. Therefore, there’s no way in hell they’ll simply jump ship. The solution? What can you provide that this current solution cannot? Perhaps the commitment to listen, respond and enact change. The modern digital workplace is about choice and choice is okay. Enable your users to make that informed decision and do what is right for their working groups. It’s another app. There’s an overhead to informing and educating our business. Of course there is. This is more around uncertainty as to the strategy for informing and educating your business. Working out the ‘what’s in it for me?’ element. There is a cost to getting Yammer into the hands of your workforce. 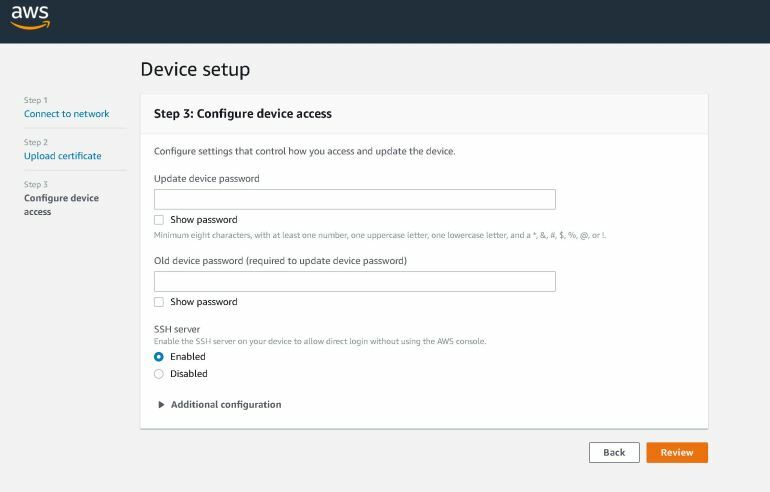 For example, from a technical perspective, you need to provide everyone with the mobile app (MAM scenarios included) and help users overcome initial sign-in difficulties (MFA scenarios included). Whatever this may cost in your organisation, your business case needs to provide a justification (i.e.) return on that investment. Campaign activities to drive adoption are dependent on the formal appointment of a Community Manager (in larger organisations), and a clear understanding around moderation. So you do need to create that service description and governance plan. I like to paint a picture representing the end state – characteristics of a mature, self-sustaining social network. In this scenario, the Yammer icon sits next to Twitter, Instagram, Facebook on the mobile device. You’re a click away from your colleagues and their antics. You get the same dopamine rush on getting an alert. It’s click bait. God forbid, you’re actually checking Yammer during the ad-break, or just before bed time. Hang on, your employee just pointed someone in the right direction, or answered a question. Wait a second! That’s voluntarily working outside of regular hours! Without pay! Yammer? Didn’t that die out a few years ago? You’ve got people who remember Yammer back in the days before it was a Microsoft product. Yammer was out there. You needed a separate login for Yammer. 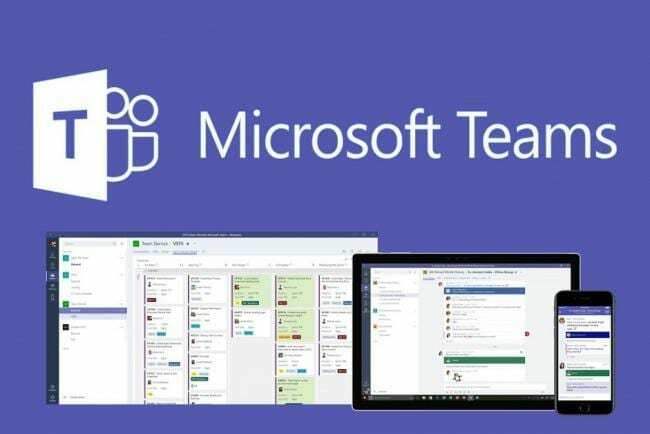 There were collaboration features built into Microsoft’s SharePoint platform but they sucked in comparison, and rather than invest in building competitive, comparative features into their own fledgling collaboration solution, Microsoft acquired Yammer instead. Roll out a few months, and there’s the option to swap out social/newsfeed features in SharePoint for those in Yammer, via the best possible integration at the time (which was essentially link replacement). 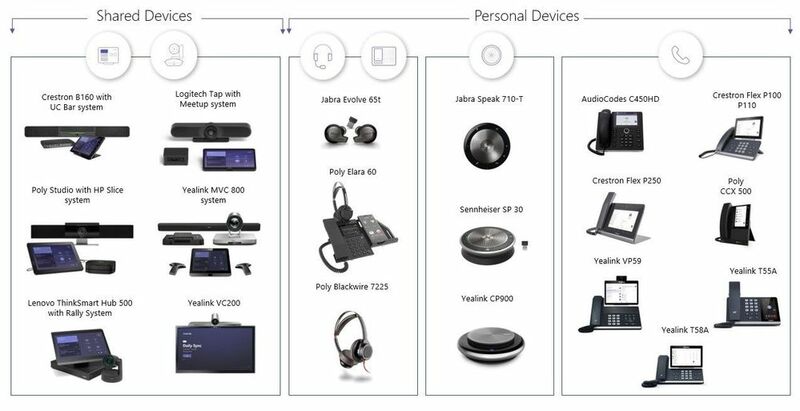 From an end user experience perspective there is little difference between Yammer now and the product it was pre-Microsoft acquisition, but the product has undergone significant changes (external groups and networks for example). Expect ongoing efforts to tighten integration with the rest of the O365 suite, understand and address the implications of cutting-off that functionality. Yammer (or your social networking platform of choice) becomes successful when it demonstrates a high value role in driving your organisation’s collaborative and social culture. In terms of maturity we’re taking self-sustaining, beyond efforts to drive usage and lead by example. Your social network is an outlet for everyone in your organisation. People new to your organisation, will see it as a reflection of your collaborative and social culture; give them a way to connect with people and immediately contribute in their own way. It can be challenging to create such an outlet where the traditional hierarchy is flattened, where everyone has a voice (no matter who they are and where they sit within the organisation). Allowing online personalities to develop without reluctance and other constraints (“if it’s public, it’s fair game!”) will be the catalyst to generating the relationships, knowledge, insight (and resulting developments) that will improve your business. A rite of passage for the majority of us in the tech consultancy world is being a part of a medium to large scale data migration at some stage in our careers. No, I don’t mean dragging files from a PC to a USB drive, though this may have very well factored into the equation for some us. What I’m referencing is a planned piece of work where the objective is to move an entire data set from a legacy storage system to a target storage. Presumably, a portion of this data is actively used, so this migration usually occurs during a planned downtime period, ad communication strategy, staging, resourcing, etc. Yes, a lot of us can say ‘been there, done that’. And for some us, it can seem simple when broken down as above. But what does it mean for the end user? The recurring cycle of change is never an easy one, and the impact of a data migration is often a big change. For the team delivering it can be just as stress-inducing – sleepless shift cycles, outside of hours and late-night calls, project scope creeping (note: avoid being vague in work requests, especially when it comes to data migration work), are just a few of the issues that will shave years off anyone who’s unprepared for what a data migration encompasses. Back to the end-users, it’s a big change: new applications, new front-end interfaces, new operating procedures and a potential shake-up of business processes, and so on. Most opt and agree with the client to taper off the pain of the transition/change period, ‘rip the Band-Aid right off’ and move an entire dataset from one system to another in one operation. Sometimes, and dependent on context/platforms, this is a completely seamless exercise. The end user logs in on a Monday and they’re mostly unaware of a switch. Whether taking this, or a phased approach to the migration, there are signs showing in today’s technology services landscape that these operations are aging and become somewhat outdated. … to put it mildly. We’re in a world of Big Data, and this isn’t only for Global Enterprises and Large Companies, but even mid-sized ones and for some individuals too. Weekend downtimes aren’t going to be enough – or aren’t, as this BA discovered on a recent assignment – and when your data amounts aren’t equitable to the actual end users you’re transitioning (the bigger goal is, in my mind, the transformation of the user experience in fact), then you’re left with finite amounts of time to actually perform tests, gain user acceptance, plan and strategise for mitigation and potential rollback. Imagine you have a billing system that contains somewhere up to 100 million fixed assets (active and backlog). The requirement is to migrate these all to a new system that is more intuitive to the accountants of your business. On top of this, the app has a built-in API that supports 500 asset migrations a second. Not bad, the migration will, therefore, take just under 20 days to complete. 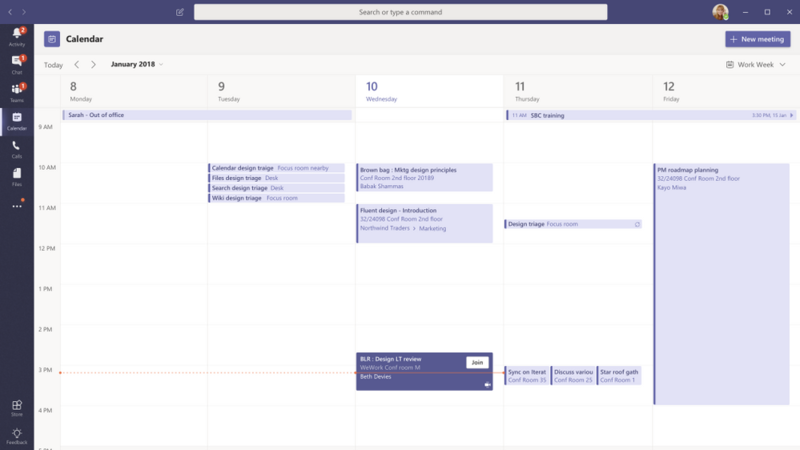 Not optimal for a project, no matter how much planning goes into the delivery phase. On top of this, consider the slowing down of performance due to user access going through an API or load gateway. Not fun. In a world where we’re looking to make technology and solution delivery faster and more efficient, the future of data migration may, in fact, be headed in the opposite direction. Rather than phasing your migrations over outage windows of days or weeks, or from weekend-to-weekend, why not stretch this out to months even? Now, before anyone cries ‘exorbitant bill-ables’, I’m not suggesting that the migration project itself be drawn out for an overly long period of time (months, a year). No, the idea is not to keep a project team around for unforeseen, yet to-be-expected challenges that face them as previously mentioned above. Rather, as tech and business consultants and experts, a possible alternative is redirecting our efforts towards our quality of service, to focus on change management aspect with regards to end-user adoption of a new platform and associated process, and the capability of a given company’s managed IT serviced too, not only support the change but in fact incorporate the migration into as a standard service offering. How can managed services support a data migration, without specialisation in, say, PowerShell scripting or experience in performing a migration via a tool or otherwise, before? Nowadays we are fortunate enough that vendors are developing migration tools to be highly user-friendly and purposed for ongoing enterprise use. They are doing this to shift the view that a relationship with a solution provider for projects such as this should simply be a one-off, and that the focus on migration software capability is more important than the capability of the resource performing the migration (still important, but ‘technical skills’ in this space becoming more of a level playing field). From a business consultancy angle, an opportunity to provide an improved quality of service is presented by looking at ways in which we can utilise our engagement and discovery skills to bridge the gaps which can often be prevalent between managed services and an understanding of the businesses everyday processes. A lot of this will hinge on the very data being migrated. This can onset positive action from a business given time and with full support from managed services. Data migrations as a BAU activity can become iterative and via request; active and relevant data first, followed potentially by a ‘house-cleaning’ activity where the business effectively de clutters data which it no longer needs or is no longer relevant. It’s early days and we’re likely still toeing the line between old data migration methodology and exploring what could be. But ultimately, enabling a client or company to be more technologically capable, starting with data migrations, is definitely worth a cent or two. Sharegate supports PowerShell scripting which can be used to automate and schedule migrations. In this post, I am going to demonstrate an example of end to end automation to migrate network Shares to SharePoint Online. The process effectively reduces the task of executing migrations to “just flicking a switch”. The migration reports are extracted out as CSV and stored at a network location. VMs are generally deployed directly in datacenters, hence, near the data source. 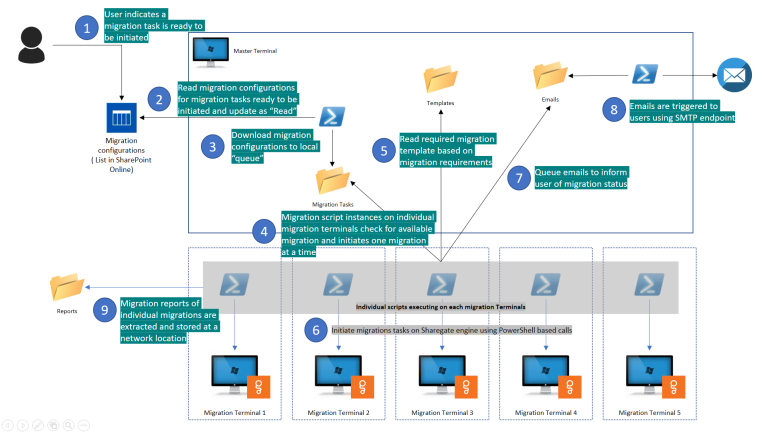 Multiple Migration terminals – It would be optimal to initiate parallel migrations and use multiple machines (terminals) to expedite overall throughput by parallel runs in an available migration window (generally non-business hours). Sharegate has option to use either 1 or 5 licenses at once during migration. We utilized 5 ShareGate licenses on 5 separate migration terminals. PowerShell Remoting – Using PowerShell remoting allows opening remote PowerShell sessions to other windows machines. This will allow the migration team to control and manage migrations using just one terminal (Master Terminal) and simplify monitoring of simultaneous migration tasks. More information about PowerShell remoting can be found here. PowerShell execution policy – The scripts running on migration terminals will be stored at a network location in Master Terminal. This will allow changing / updating scripts on the fly without copying the script over to other migration terminals. The script execution policy of the PowerShell window will need to be set as “Bypass” to allow execution of scripts stored in network location (for quick reference, the command is “Set-ExecutionPolicy -ExecutionPolicy Bypass”. 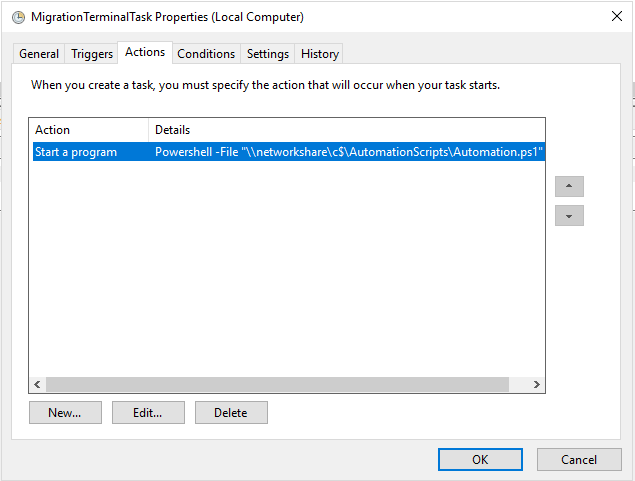 Windows Scheduled Tasks – The PowerShell scripts are scheduled as tasks through Windows Task schedulers and these tasks could be managed remotely using scripts running on the migration terminals. The scripts are stored at a network location in master terminal. Windows 10 virtual machine installed with the required software. Windows 10 Virtual machines each installed with the required software. A list was created on a SharePoint online site to enable users to indicate that the migration is ready to be processed. The updates in this list shall trigger the actual migration downstream. The migration plan is pre-populated in this list as a part of migration planning phase. The migration team can then update one of the fields (ReadyToMigrate in this case) to initiate the migration. Migration status is also updated back to this list by the automation process or skip a planned migration (if so desired). The list provides as a single point of entry to initiate and monitor migrations. In other words, we are abstracting out migration processing with this list and can be an effective tool for migration and communication teams. 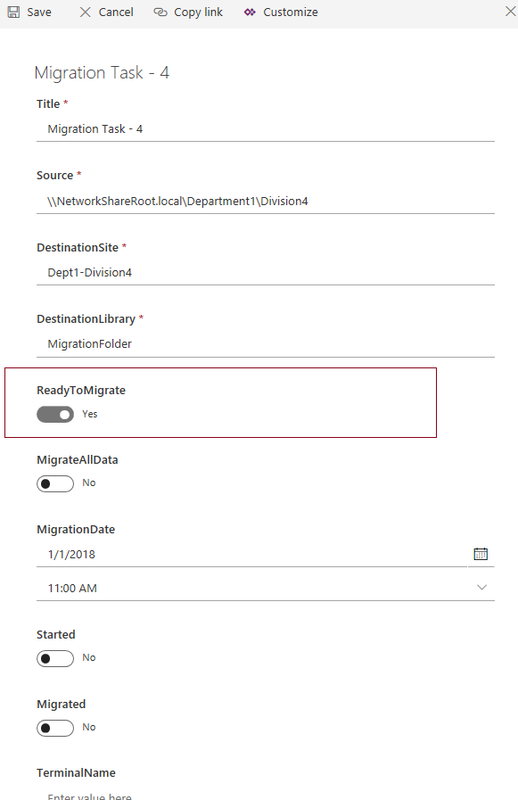 After the migration team is ready to initiate the migration, the field “ReadyToMigrate” for the migration item in the SharePoint list is updated to “Yes”. The script below creres the source list in sharepoint online. The file stores the credentials and can be used subsequent scripts. A PowerShell script is executed to poll the migration configuration list in SharePoint at regular intervals to determine if a migration task is ready to be initiated. The available migration configurations are then downloaded as CSV files, one item / file and stored in a migration packages folder on the master terminal. Each CSV file maps to one migration task to be executed by a migration terminal and ensures that the same migration task is not executed by more than one terminal. It is important that this script runs on a single terminal to ensure only one migration is executed for one source item. Loads the required configurations based on the required migration outcome. The migration configurations specify migration options such as cut over dates, source data filters, security and metadata. More about this can be found here. Extracts the secondary migration report as CSV to derive paths of all files successfully migrated. These CSV can be read by an optional downstream process. Checks for another queued migration to repeat the procedure. The script triggers emails to required recipients. This script polls a folder: ‘\masterterminal\c$\AutomatedMigrationData\mails\input’ to check any files to be send out as emails. The csv files sepcify subject and body to be send out as emails to recipients configured in the script. Processed CSV files are moved to final folder. The PowerShell script utilizes PowerShell remoting to manage windows Task scheduler tasks configured on other terminals. The migration automation process as described above helps in automating the migration project and reduces manual overhead during the migration. Since the scripts utilize pre-configured migration options / templates, the outcome is consistent with the plan. Controlling and monitoring migration tasks utilizing a SharePoint list introduces transparency in the system and abstracts the migration complexity. Business stakeholders can review migration status easily from the SharePoint list and this ensures an effective communication channel. Automated mails informing about migration status provide additional information about the migration. The migration tasks are executed in parallel across multiple migration machines which aids in a better utilization of available migration window. Why Continual Service Improvement (CSI) is Required? The goal of Continual Service Improvement (CSI) is to align and realign IT Services to changing business needs by identifying and implementing improvements to the IT services that support Business Processes. The perspective of CSI on improvement is the business perspective of service quality, even though CSI aims to improve process effectiveness, efficiency and cost effectiveness of the IT processes through the whole life-cycle. To manage improvement, CSI should clearly define what should be controlled and measured. CSI – Measure and improvement process has 7 steps. These steps will help to define the corrective action plan. Like all programs, CSI also have its challenges, critical success factors and risks. Some of these are listed below. It is absolutely important that to implement the CSI program that we need the senior management’s buy-in. Please remember transforming IT is a Process/Journey, not an Event.